VHS operate as dealers for 'Concept,' whose range of powered and non-powered cultivators are available in widths between 1m and 8m. These can be rigid or hydraulically folded for transport. Power Harrows and Rotavators are available with choice of 'Flexicoil', cage or packer rollers. 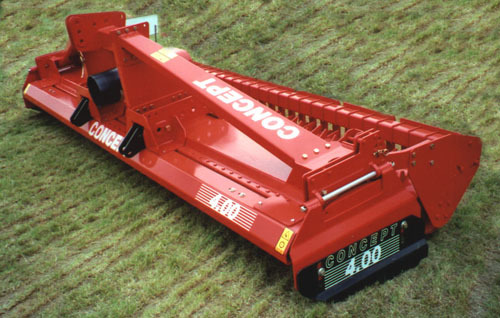 As well as land preperation machinery, 'Concept' also manufacture a range of flail and universal mowers. Front and rear mounted are available across a wide range of machines. This is all supported by a delivery service. The size of this machinery ranges from 1m to 8m. There are different models for different tractor horsepowers. Rear bed shaping hoods are available and the machine can be off set, manually or hydraulically. A fixed position, rigid machines or hydraulically folded is available. The size of this machine ranges from 1.75m to 8m. Different models are available for different tractor horsepowers. Rigid machines or hydraulically folding available. Available 1m-8m wide. There are three different models with various tine/roller configurations for different soil types available. Rigid or hydraulically folding machines available.